Make your sentences complete with these complete sentence exercises. In these exercises, your child will learn to identify sentence fragments from complete sentences, and what needs to go into a sentence to make it complete. These online exercises are perfect for test review or over the summer to prevent stagnation. For more language learning, have them try learning the different Types of sentencesNext. 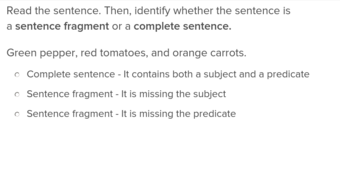 What differentiates a sentence fragment from a complete sentence? A complete sentence contains a subject and a verb, whereas a sentence fragment uses only one or none of those, but might still make sense. We use sentence fragments all the time in casual conversation, but that doesn't make it correct. Help your child learn how to write complete sentences -- and when they should use them -- with one of our complete sentence exercises, designed to make sense to young students. Our exercises focus on common areas of study for different grades, and are based on national curriculum standards, so they support whatever most students are studying. Our complete sentence exercises are a quick way to boost languge learning, and are written and reviewed by our team of education experts for solid skills to back them up. Once they're done with these, you can have your child study more grammar with our exercises about ArticlesHere.